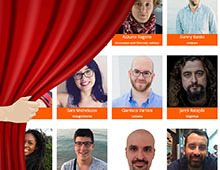 Our Codemotion Rome Conference is approaching at pace, so we’re so excited to announce some more speakers who will rock the stage on March, 22-23 at Ingegneria Civile Roma Tre. Curious to know their names and background? Have a look below and secure your spot now if you are still without a ticket! CLAUS IBSEN (Red Hat) is a Sr Principal Software Engineer who works primarily as the project lead on Apache Camel. Read his full bio here. SARA MICHELAZZO (ThoughWorks) is a Lead Consultant Experience Designer with a focus on global organizations and digital transformation projects. Get to know her here. GIANLUCA VARISCO (Arduino) is a Chief Information Security Officer and he covers many fields like corporate security, information protection, and network security. More details here. JAREK RATAJSKI (Engenius) is an Anarchitect with 15 years of experience developing JEE software for various companies and projects. More info here. HORACIO GONZALEZ (OVH) describes himself as Software Engineer by day, leader of the FinistJUG, GDG Finistère and BreizhBeans communities by night. His bio is here. ANDREA COSENTINO (Red Hat) is a Sr Software Engineer but also member of Red Hat Fuse Engineering Team. Want to know more? Click here. GIOVANNI MELLINI (Enav S.p.A.) is Head of Information, Systems and Network Security but also founder and president of Cyber Saiyan, a no-profit organization founded to spread cybersecurity and ethical hacking culture. Read his full bio here. SANDER MAK (Luminis) is a Fellow at Luminis in The Netherlands, where he crafts modular and scalable software. Here you can discover more about him. JOHN MUM (Wallaroo Labs) is Lead Software Engineer and he is currently working on an open source high-performance framework. More details here. MIKE CHERNEV (ING) is a Software Engineer with a passion for software but also processes and people around them. Get to know him here. ALBERTO MASSIDDA (Sourcesense) is a ML/DL Advocate with 10 years of experience from devops to machine learning, and more. Read it all here. JAVIER LASA (Prisa Tecnología) is Head of Product Innovation Multimedia and Mobility with more than 15 years of experience. Get to know him here. ALBERTO FORNI (Balsamiq) is Sr Software Developer and he works on the core and web team. More info here. LUCA CIPRIANI (Arduino) is CIO and Cloud Business Manager, but also Linux user and DevOps advocate. His bio is available here. NICOLA FERRARO (Red Hat) is Sr Software Engineer, Apache Camel PMC member, creator of Camel K, and more. Get to know him better here. MATTEO ANTONY MISTRETTA (Inglorious Coderz) is a consultant and founder of Inglorious Coderz, and he currently develops web and mobile projects. His full bio is here. Now, secure your seat by getting your Regular Ticket.